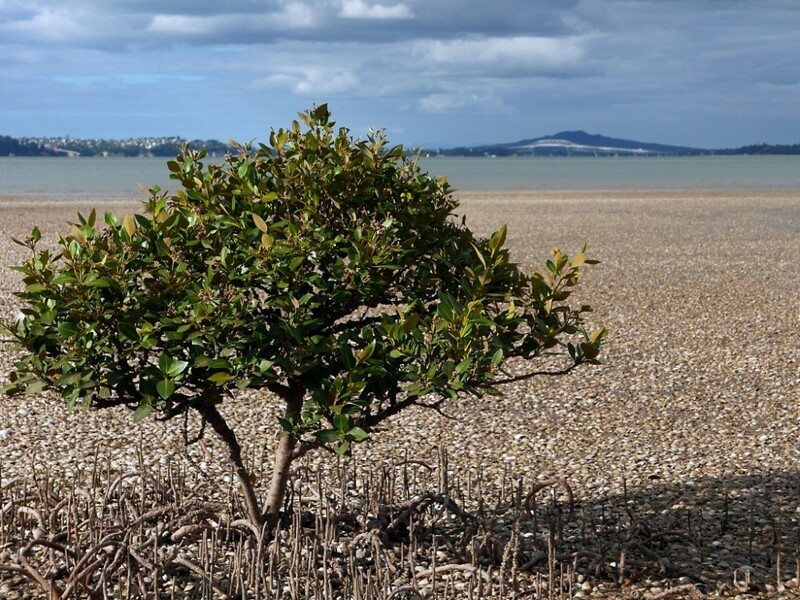 Tonight’s “Our Changing World” radio programme features a visit by Veronika Meduna and me to Motu Manawa, the “island of mangroves” beside Auckland’s northwestern motorway. Here’s how it came about . . . I hadn’t seen Veronika Meduna, one of the founders of Radio New Zealand’s long-running “Our Changing World” science and environment programme, for years. She’s based in Wellington, and I’m in Auckland, and our paths don’t cross very often. So when she texted to ask if we could visit some mangroves for a radio spot, I was delighted. Both because she’s a very good radio presenter, and because any day in the mangroves is a good day. 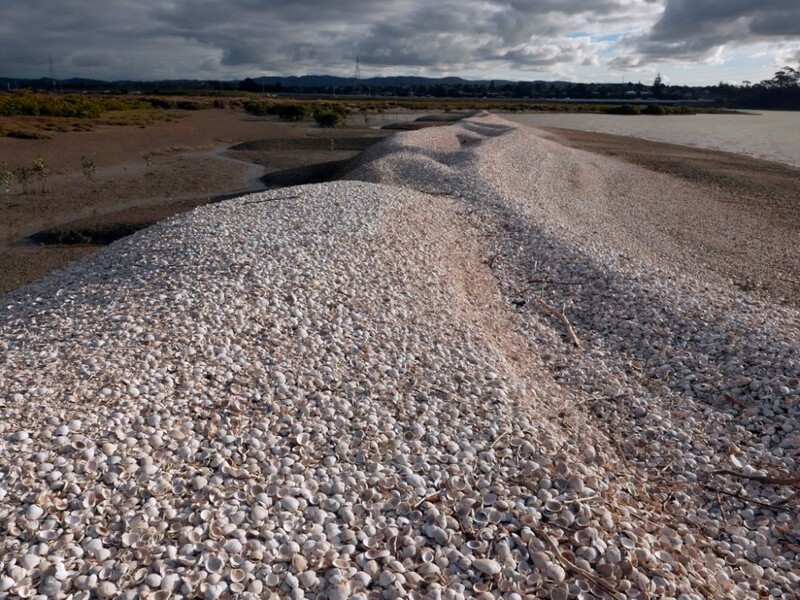 I immediately thought I would take her to Motu Manawa/Pollen Island, my “wilderness next door”—a nature reserve in the heart of a marine reserve right next to SH16, one of the main commuter routes between central Auckland and the northwest. It wasn’t OK. There was scaffolding around the concrete pier and some workers chipping away with chisels. Evidently that constituted a hazard to walkers. The Well-Connected Alliance—the construction consortium doing the motorway work—had disconnected me. I returned home to consider my options. 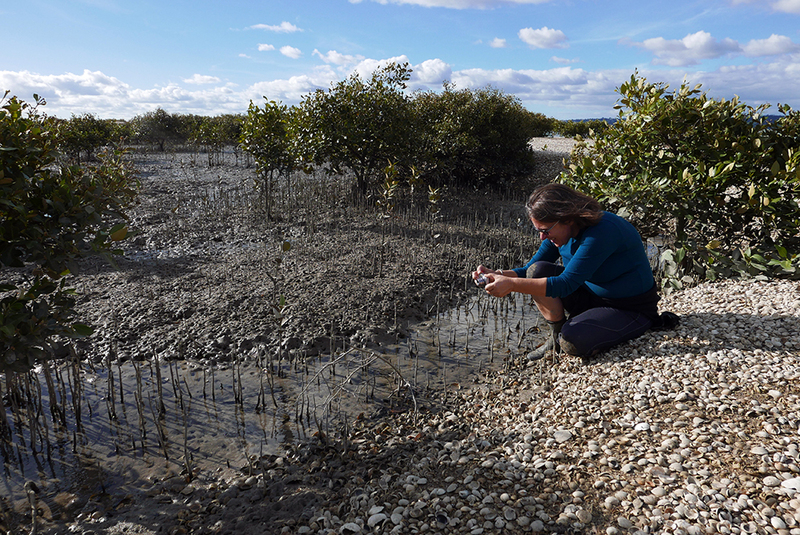 Find some other mangroves—there are plenty up the Whau—or . 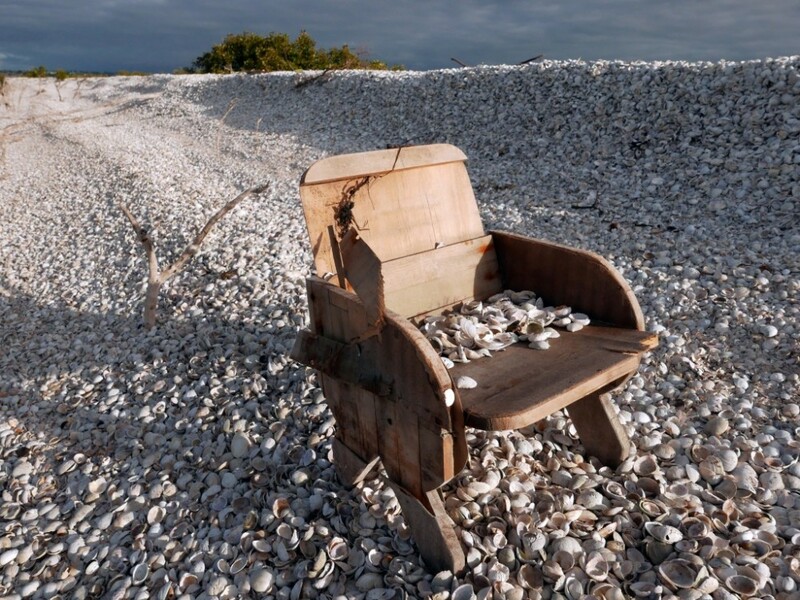 . . approach by sea. For a year, I’ve been storing a friend’s tandem kayak in my garage. Was Veronika perchance a kayaker? We could launch across the river at Te Atatu boat club, paddle a few hundred metres and we’d be at the island. Yes, she was. 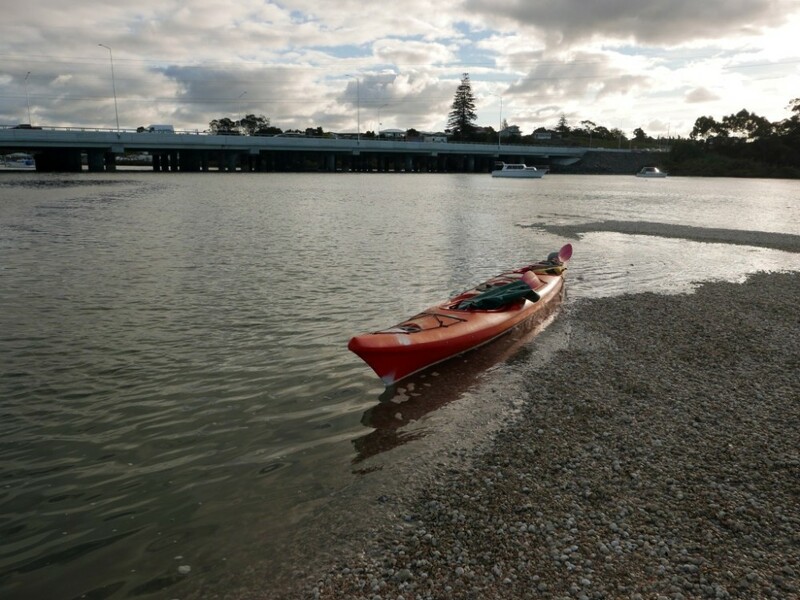 She kayaks from her home in Titahi Bay to Mana Island, 2 km offshore, so crossing a muddy creek under the northwestern motorway was going to pose no problems at all. We launched at low tide and a few minutes later had eased beside a shell bank of white cockle shells at the western end of the island. We lifted the kayak to the top of the shell bank—a couple of metres above the water—and set off. Over the next few hours we explored the mangroves, examined the remains of Daniel Pollen’s shell works (for manufacture of lime), recorded some audio for the radio spot, checked what flotsam had washed ashore, listened to the chip-chip-chip of a fernbird, looked for grasshoppers, and generally marvelled that such a lovely fragment of wild nature lies so close to one of the busiest industrial, residential and commuter sites in Auckland. It was getting close to high tide when we returned. Small rivulets we had crossed were now wide stretches of lapping water. It crossed my mind that maybe we hadn’t lifted the kayak high enough. Swimming the channel wasn’t a pleasant prospect. As we came in view of the shell bank, sure enough, it was under water. (Had I checked the tide range I would have seen that it was 3.4m that day.) But there was the kayak, obediently bobbing next against a higher bank a little further along, pushed there by a convenient onshore breeze, almost parallel parked, ready for us to climb in. All’s well that ends well. Once again, Motu Manawa had provided discovery, adventure and the solace of the wild. And a lucky onshore wind ensured a dry journey home.